Goddess of Wine: Wineaux of the Goddess - March Meeting - Campania! Wineaux of the Goddess - March Meeting - Campania! 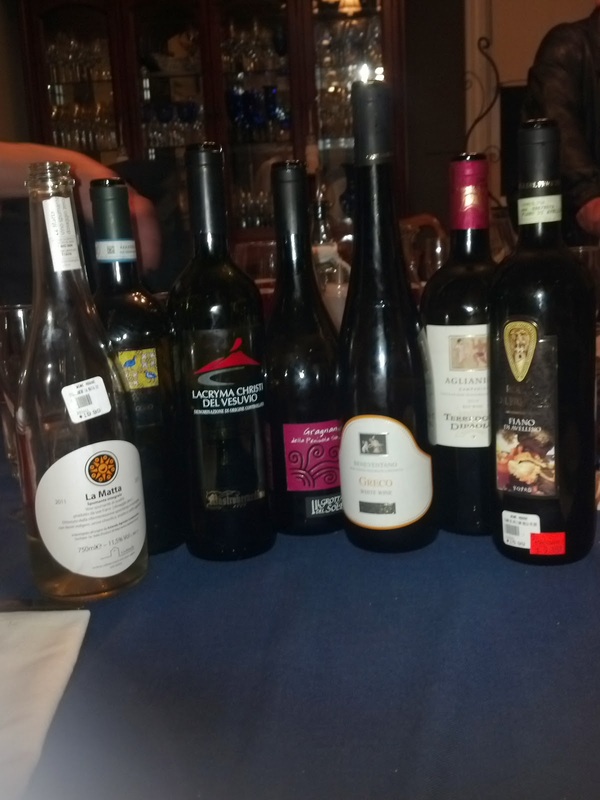 The Goddess of Wine and her merry band of Wineaux met to taste the wines of Campania. Tasters included Barbara B., Debra B., Shawn H., Rico M., Marya G., Xochitl M., JD, and me. Campania is the ‘shin' of Italy's boot, anchored by its capital, Naples. Its name comes from Campania felix, a Latin phrase roughly meaning 'happy land'. The region has strong historical links to wine and vine, dating back to the 12th century BC, and is one of Italy's very oldest wine regions. The influence of ancient empires, including the Greeks, Romans and Byzantines, means some of this area's varieties have historical legends attached. The area is also famous for producing Falerno (Falernum), one of the most ancient wines in Italy. Campania, like many Italian regions, is home to an impressive array of grape varieties, some of which are found almost nowhere else on earth. Its most important variety is arguably Aglianico, the grape behind the region's two most famous and respected red wines: Taurasi and Aglianico del Taburno. Aglianico was introduced to the area by the Greeks and later cultivated by the Romans. Also vital to Campania's vineyards are the white-wine varieties Fiano and Greco, which are championed by the region's most respected white wines, Fiano di Avellino and Greco di Tufo. Viticulture is in its element thanks to an abundance of sunshine, dry hot summers, mild winters, a long growing season and volcanic soil (the latter ensured phylloxera was kept at bay). The coastal Mediterranean breezes blow in from the Tyrrhenian Sea and across the Apennine Mountains to temper the heat, encouraging a bright acidity in the fruit. These factors also contribute to the varied qualities of Campania wines. For instance, an inland Falanghina grown on slopes where there is more rainfall offers more fragrant notes than those found on the coast, where the climate is continental and tends to be more mellow. Interesting note: Traditional foods from the region include pizza and spaghetti alla putanesca. Hostess Xochitl did not disappoint in her food pairings, providing crunchy Italian bread, Asiago cheese and a wonderful cheesy pasta supplemented with mild Italian sausage and olives. Next up: Wines of Austria! Cheers!